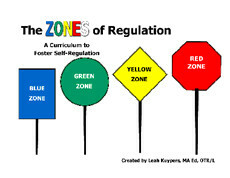 The ZONES of Regulation is a curriculum written and created by Leah M. Kuypers. The goal of The Zones is to help students develop social, emotional and sensory regulation. The Zones uses four colours to help students visually and verbally self-identify how they are functioning in the moment given their emotions and states of alertness. It helps them to understand how and why they shift from one zone to the next and ways to keep themselves at a more consistent and comfortable level of functioning. Then students can use the strategies they have learned to help themselves calm down, wake up or stay alert and in the Learning Zone! Since moving to Calgary I have been speaking to groups about the importance and benefits of combining the Zones of Regulation program with the power of understanding the functions of behaviour. Self-regulation follows the same principles of any other behaviour. Knowing whether the outcomes of regulating one's body and emotions (or not) are reinforcing a need will make the difference between success and failure. Here's an example. A little boy now in Grade 2 who also has an autism diagnosis is finding the increased classroom expectations a little overwhelming. Although he reads quite well and has good verbal skills there are new academic and social demands that he has to work hard to meet. Some days he does okay. Other days he can't cope and cries, yells and lays on the floor and takes his shoes off. His teacher doesn't know exactly what the problem is but she has discovered that he will calm down if she lets him play in the corner with his iPad or Lego. This seemed to work except that now he often has another meltdown when she says it is time to stop. Plus, he is doing less and less work in the classroom and spending more time in the principal's office playing Lego. He has a much less difficulty staying regulated in a quiet space working one to one with an adult. How do we help this student? Read through the powerpoint presentation below and see what plans you think could be put in place.